Tobii Eyetracking is supported for head and eye tracking. Tobii Eyetracking is supported in the Humanoid Control Pro package. For Tobii Eyetracking to work, the Tobii Unity SDK needs to be imported into the project. Click the button to go to the download page for the Tobii SDK. 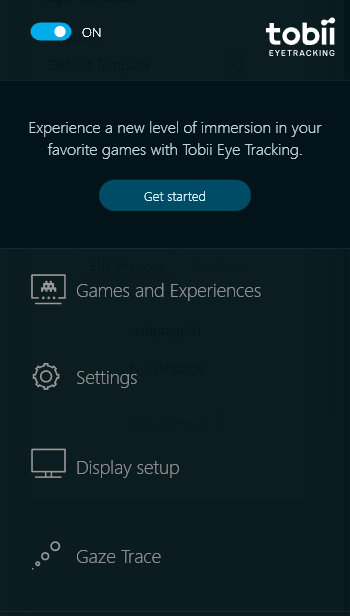 Disabling Tobii Support ensures that no code related to Tobii EyeTracking is included in the build. To enable tracking with the Tobii eyetracker for an avatar, Tobii needs to be enabled in the Humanoid Control component. The Tobii (Transform) is a reference to the Transform in the scene representing the Tobii Tracker. This GameObject is found as a child of the Real World GameObject and is only visible in the scene when Humanoid Control->Settings->Show Real Objects has been enabled. The Tobii (Transform) can be used to set the position of the tracking relative to the player in the scene. Head and eye tracking can be enabled separately on the head target.